Thread: Pattaya celebrates “Visaka Bucha”. The three most important holy days of the year for Thai Buddhists all include the word "Bucha", which means to pay homage. But the most auspicious of the three is Visakha Bucha, which simultaneously commemorates three important anniversaries in the life of the Lord Buddha: his birth, his enlightenment, and his death. The Lord Buddha passed away exactly 80 years from the day of his birth. On that day, 2552 years ago, when the count of the years of the Buddhist Era began, the Buddha achieved the ultimate goal of merging his enlightenment with Nirvana, freeing himself forever from the eternal cycle of death and reincarnation which is the fate of lesser mortals. His death occurred on the 15th day of the waxing moon of the 6thlunar month and it is on this day each year that Visakha Bucha is celebrated. On Visakha Bucha Day, Buddhists from around Thailand demonstrate their high regard for the Triple Gems of Buddhist philosophy: The Lord Buddha, the great teacher; The Dhamma, Lord Buddha's teachings; and The Sang ha, the brotherhood of Buddhist monks. On Friday Night we attended the Chaimongkon Temple on the South Pattaya Road where thousands of Thai’s and Foreigners took part in the evening’s ceremony which included a procession around the Temple three times, known in Thai as “Vientien”. Fun Run on the Mountain to celebrate Visaka Bucha. At the front of the Tourist Police station, an event which takes place every year on the Pratamnuk Mountain on Visaka Bucha Day occured. 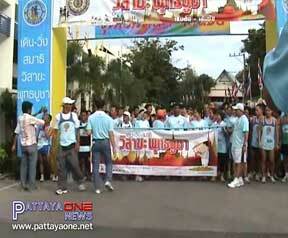 Khun Wootisuk, Deputy Mayor of Pattaya opened a fun run attended by over 1,000 people. 60 Monks attended the event to lend their support to the runners and those that completed the race were presented with medals. Following the race, a ceremony was held to celebrate this important day in the religious calendar followed by a procession of people who made their way to the Chaimongkon Temple in South Pattaya to continue the celebrations of Viska Bucha.